This part of the gallery contains work which doesn't fit neatly into another area. It often has the newest ideas and work in it. In the Studio paintings I have tried to sketch out my studio as I have, or in the order that I have viewed it, rather than in the way the single fixed viewpoint of a camera lens records. I have included all the key features of the room that one observes when taking in the detail of a place. Thus the pictures contain all four side of the room at the same time. This explains the distortion of the images and the curves where one would expect a straight line. 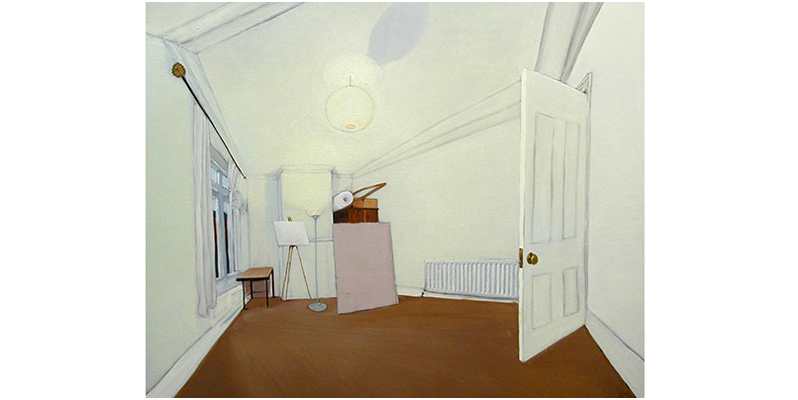 The paintings work as a pair in that they are painted from observations taken from opposing corners of the same room, helping to give the viewer a better feel for the place. The primed canvas' themselves can be seen within each picture. The watercolour sketches of a chair were a further investigation into the ideas shown in previous paintings containing more than one perspective. They help to communicate that we observe things in the round or in three dimensions, not just from one fixed viewpoint or angle, as the camera would have us believe. As with the other pictures with a cubist theme, they relate back to Hockney's work and specifically his work about reverse perspective, and it's possibility as a way of representation. Shoe Painting is a kind of self portrait in that it reveals something about the artist. It draws links with the shoe paintings of Van Gogh, also refering to the richness of colours and textures from even further back in the still life genre, but there are also echoes from more contemporary shoe paintings like those of Lisa Milroy from the 1980s. Whereas in the past I have used photocollage in the creation of various compositions for painting, with this piece I have made the transition to digital to enable greater flexibility. It led on to the commissioned piece: Shoes#2.